The original Bridge of the Gods was created during the eighteenth century by the Bonneville Slide, a major landslide which damned the Columbia River. The river eventually removed the slide, however this event is remembered by the Native Americans as the Bridge of the Gods. It is now the name of the bridge that crosses the Columbia River between Oregon and Washington. And it is one of the most spectacular rides you will ever do. I’ve raced in numerous countries all over the world and nearly every state in the U.S. However this ride to me is the epitome of cycling. I cannot recommend it enough. Beginning near Mt Tabor Park east of downtown, head north across the Columbia on the I-205 path. Here you’ll hop onto the Evergreen Hwy. If you fancy this road, prepare yourself dear rider. Washougal River Rd/Hwy 140 awaits and it just keeps getting better. The views of the river are numerous as you pass the rushing water and the occasional fisherman. Cross the river where it turns into Canyon Creek and climb to the top and then eventually drops down to Hwy 14. Hwy 14 runs you all the way to the Bridge of the Gods. It begins generally down hill, so enjoy a snack here if you like. Then climb up to Beacon Rock State Park where you can fill your bottles. 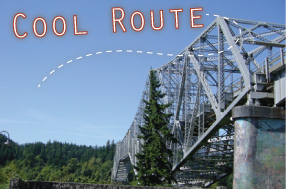 If you need food or a soda, carry on to the Chevron gas station a few more miles down the road, past the Bonneville Dam. Now you’ve arrived at the bridge. I personally can’t resist looking down while crossing over. The bridge surface is a metal grate so you can look straight down at the Columbia. Of course, it should go without saying that you need to pay attention while you ride. And do try and have a look at the view while you’re there. Unfortunately, the bridge doesn’t have any place to stop, so photos aren’t really an option. But the ride home on the Oregon side will offer plenty of opportunity. After leaving the bridge, you’ll cross under it where an outstanding mural presents itself of the area and how it looked a long time ago. From here, immediately hop onto the bike path and follow it for the next 6 miles. This is my favorite path of all time. I do this ride so often purely to return to this path. The rich history abounds as you realize that many portions of the path are the original Scenic Hwy, which was lost to progress in the name of the I-84. Once back onto the Historic Columbia River Hwy (or Crown Point Hwy) keep an eye out for the small stone fountain on your left. Depending on the time of year, the stone bowl may be dry or covered in moss. Decide for yourself whether to fill your bottles here, but I stand witness as someone who has drunk from the fountain in all conditions…and survived. From here you’ll pass numerous waterfalls on your way home including the famous Multnomah Falls. But they are everywhere really between enormous falls and quiet trickling streams. This section of road is life changing. Climb up to Crown Point for your last view of the gorge. If the visitor center is open here, there are bathrooms and a fountain, although they may have you take off your shoes before entering because of the marble floors. Then descend back to Troutdale and head home, smiling all the way. This route comes to us courtesy of Rubber to the Road, the longstanding resource for interesting routes.